Bridgewater’s One Book One Community Committee will sponsor a kick-off program at the Bridgewater Public Library on Saturday, February 9th. “Sailors’ Arts and Hearts” will take place from 11a.m. to 1p.m. 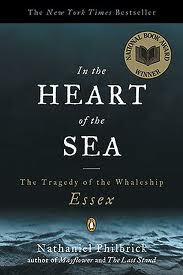 as a prelude to the introduction of the current OBOC choice: In the Heart of the Sea, by Nathanial Philbrick. In the Heart of the Sea is a true survival story focused on the ordeal of the Whaleship Essex, which was rammed and sunk by an angry sperm whale in 1819. The crew drifted for more than ninety days in three tiny whaleboats, succumbing to weather, hunger, disease, and ultimately turning to drastic measures in the fight for survival. An intense and mesmerizing read, In the Heart of the Sea is a monumental work of history forever placing the Essex tragedy in the American historical canon. The kick-off event will be held in the public library’s Flora T. Little Meeting Room on the lower level. Light refreshments will be served.